Water is a finite resource on this planet. Only 2% is fresh, clean water that is needed for human life. Water is precious, and we need to treat that way. Historically in California, it has been under-valued and under-priced, a factor leading to overuse. Things are changing, however, and water is becoming more expensive. You should plan for water security and economy. Pumping more water than you need wastes money. Storing water during the wet season and conserving will help insure that you have water when you need it. If we all conserve, the health of the Eel River will improve, and so will community health and our quality of life. Using Graywater and Stormwater to Enhance Local Water Supplies: An Assessement of Risks, Costs and Benefits. Committee for Beneficial Uses of Graywater and Stormwater. 420pg. How Much Water Storage Do I Need? Before you can understand how much storage you need, you need a water budget. Excess storage can lead to unneeded expense and diversion of more water than is necessary. The first step to achieving water security is installing a water meter. You should have one for your house and another for your garden so that you know your domestic and irrigation water use. Make sure that you purchase a system with a leak indicator to prevent unneeded loss and water waste. To achieve water security, you need to think about available resources and your potential need, and then calculate a water budget. Water planning needs to be done in advance, not when you are in a crisis. People often over-estimate their water needs, which can lead to unnecessary expense of purchasing too much storage capacity. Water use varies tremendously with the season, as does water supply, so it may take a while to gather the data needed. Water use data may also be required for some permitting processes. In order to obtain a State Water Resources Control Board permit, basic water use data must be collected and estimates of use based on those data. 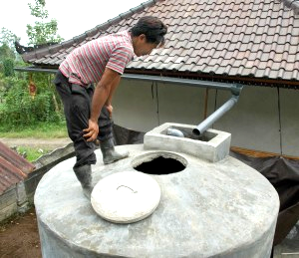 Storage Tanks can help capture water when it is abundant in the winter and store it for later use during the dry season. 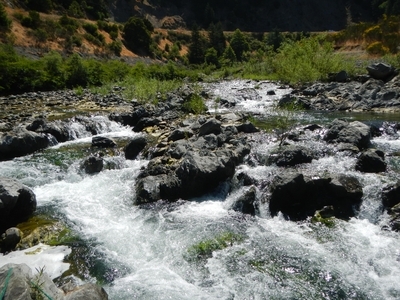 Stream flows in the Eel River basin can be greatly enhanced if more farmers use stored water instead of diverting water from springs and creeks during late summer and early fall. When installing large water storage tanks on hillslopes, be sure to consult an engineering geologist regarding slope stability. Rain water from your roof can supply a significant amount of the water you use. If your roof is plumbed into a storage tank, you can get 600 gallons of water from every inch of rain per 1000 square feet of roof. Water caught in this way does not require a permit from any agency. 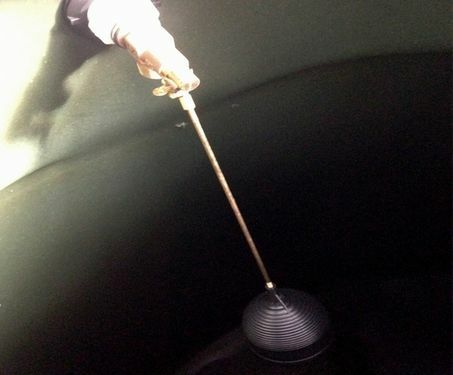 Whenever multiple tanks are installed for water storage, each tank should be equipped with its own shut off valve. This prevents catastrophic loss of water, if one valve in the system is left open. Every water tank should have a float valve to shut off the intake and prevent overflow. Water spilled below your tank can saturate soils and increase risk of slope failure. 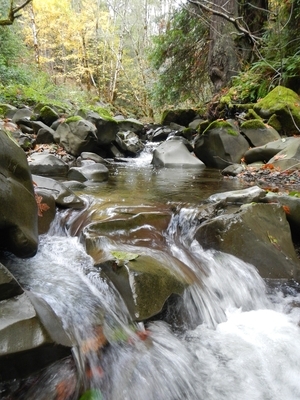 Leave as much water at its source as possible for Nature and your downstream neighbors. Ponds are a common method of water storage in the Eel River basin and they can be part of a water supply system, but there are several concerns that farmers should be aware of. Bigger is not better, so make sure you calculate a water budget and design your pond according to your needs. Water weighs 8 pounds per gallon and the mass of water stored in a pond has enormous destructive force, if unleashed. 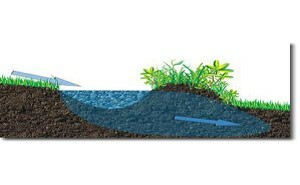 Ponds located on hillslopes can trigger mass wasting, if not properly designed and located. Maintain vegetation at the outlet and surrounding the pond to filter runoff and to reduce evapotranspiration. Cattails are known to inhibit cyanobacteria and can help keep your pond in balance if established along the perimeter. Exotic aquatic species are often introduced into ponds purposefully or sometimes accidentally, including non—native warm water fish, amphibians, turtles and invertebrates. These organisms are released downstream during higher flows and many pose an ecological risk to the Eel River. Ponds may also develop noxious algae blooms. Cattails can suppress cyanobacteria development and may be useful in reducing blooms and risk. Top watering your plants can often be very inefficient, especially if the soil dries out and becomes hydrophobic. Instead, you should deep water for maximum delivery to the root zone. Insert PVC pipe into the soil at the zone of root depth with small perforations to let water out. Feed water at the top with drip system as shown in photo at right.